Although children will love playing on the Kasai Angler, it is a substantial kayak that they will find to be heavy to move and manoeuvre. They will not experience the performance or responsiveness of this kayak purely because it will be too big for them. For fishing, children are better suited to the Tarka Angler kayaks. The Kasai’s large rear Tankwell is perfect for your dog – if you have not filled the tankwell with fishing gear. If you do take your dog out, line the tankwell with a foam mat to prevent their paws sliding so that they can sit upright to enjoy the scenery. 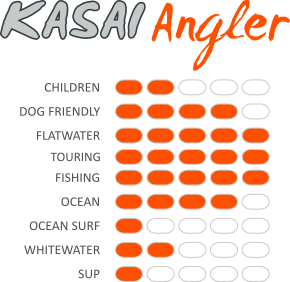 The Kasai Angler is a dream on flatwater. Its four-metre length gives it superb speed. The Kasai Angler is great kayak for touring with decent speed, and lots of stability, comfort and storage space for multi-day trips. 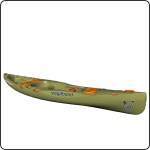 Solid and stable, and with plenty of space, Kasai Angler is a great fishing kayak. Kasai Angler comes with two flush-mounted Rod Holders, Deck Rails (to customise the deck by attaching gear and accessories) and an Anchor Trolley. On the ocean, the Kasai Angler performs superbly. Thigh Straps attached to the Clip Rings will keep you on the deck should a wave catch you by surprise and they allow for greater control. Use the Tankwell, 8″ Screw Hatches and 8″ Day Hatch to securely stow gear. From one-day to multi-day trips, the Kasai Angler is an excellent seaworthy kayak. The Kasai Angler enjoys surfing smaller waves, but for real wave surfing, get our Dumbi kayak instead. While river tripping is a pleasure on the Kasai Angler, keep to sections of river with smaller rapids. Use Thigh Straps attached to the Clip Rings for better control. We don’t recommend paddling the Kasai Angler from a standing position but we do recommend standing up on the Stand-Up Platform to stretch your legs while you’re out on the water.